A major new book from #1 New York Times bestseller and sports-writing legend John Feinstein, QUARTERBACK dives deep into the most coveted and hallowed position in the NFL - exploring the stories of five top quarterbacks and taking readers inside their unique experiences of playing the position and holding the keys to their multi-billion-dollar teams. In the mighty National Football League, one player becomes the face of a franchise, one player receives all the accolades and all the blame, and one player's hand will guide the rise or fall of an entire team's season - and the dreams of millions of fans. 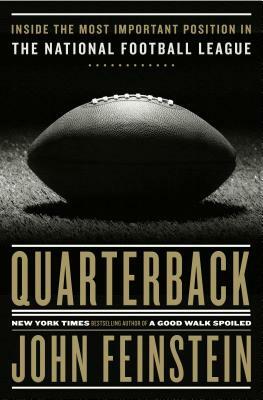 There are thirty-two starting quarterbacks in the NFL on any given Sunday, and their lives are built around pressure, stardom, and incredible talent. Legendary bestselling sportswriter John Feinstein, in his most insightful book yet, shows readers what it's really like to play the glory position and to live that life - mapping out a journey that runs from college stardom to the NFL draft to taking command of the huddle and marching a team down the field with a nation of fans cheering. Feinstein builds his profile around five NFL starting quarterbacks - Alex Smith, Andrew Luck, Joe Flacco, Ryan Fitzpatrick and Doug Williams. With incredible inside access, we get the full quarterback experience...being drafted #1 overall, pushing through grueling injuries, winning Super Bowls, being named a starter on multiple teams, being the first African American QB to lead a franchise to a title. Feinstein shows us exactly what it's like in the locker room, huddle, heat of battle, and press conferences, through spectacular moments and embarrassing defeats. He explores the controversies of a league embroiled in questions of substance abuse and racism, TV revenue, corporate greed, and the value placed on player health. And in the end, Feinstein addresses the ways in which each quarterback - some just a year out of college -- is handed the keys to a franchise worth billions of dollars, and how each team's fortunes ride directly on the shoulders of its QB. This is Feinstein's most fascinating behind-the-scenes book. JOHN FEINSTEIN is the #1 New York Times bestselling author of the classic sports books A Season on the Brink and A Good Walk Spoiled, along with many other bestsellers including The Legends Club, Where Nobody Knows Your Name and The First Major. He currently writes for The Washington Post, Golf Digest, and Golf World, and does commentary on the CBS Sports Radio Network. "Another must-read from a master of long-form sports journalism." "Eminent sportswriter Feinstein embedded himself with five successful quarterbacks . . . tak[ing] readers from one breathtaking finish to another. With a critical eye and unsurpassed sense of sports history and culture, Feinstein examines qualities of leadership, the politics and drama within locker rooms and league offices, and the unrelenting pressure that can either crush a quarterback or turn him into a legend. Stellar research and storytelling that makes this an essential read for NFL fans and sports enthusiasts." "A worthy offering for fans of the modern, increasingly embattled game."